Over the past few weeks in Southeast Asia, I’ve made the same mistake many times. I arrive at an iconic sketching spot (which has often been a temple) and I begin to sketch it immediately without even looking around the site. And because I usually sketch until the last minute, there’s never enough time to do a proper visit. Today I managed to do both. I drew from a floating restaurant below the bridge, and then, like many others, I crossed it on foot. Luckily I’m not afraid of heights because there’s a train that goes from Bangkok to Kanchanaburi on the Death Railway and I was on the bridge when it passed. There are small platforms you can step on to get out of the way, but they hang out over the river so don’t look down if you are the least bit acrophobia. I know this sounds like a guidebook, but it’s well worth the trip to see the views over the river and the hills of Burma in the distance. Wow! 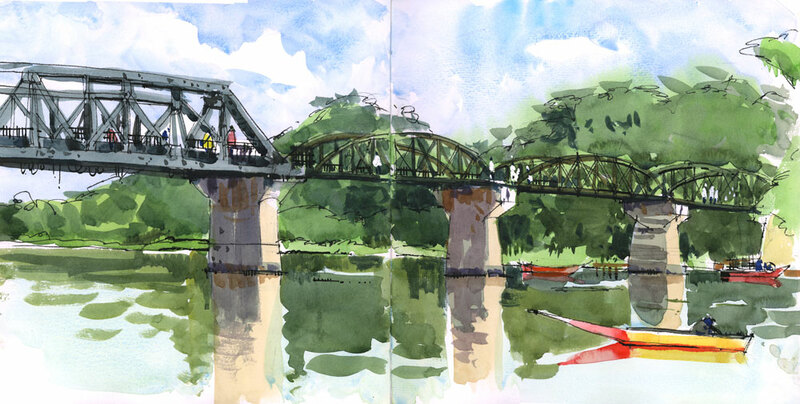 You’re not only a great urban sketcher, but a world-wide adventurer too. I just wanted you to know that I was delighted when I purchased a copy of Leisure Painter, a British magazine that I get from time to time, and there you and your painting were in a three page spread by Tony Underhill entitled “Join the Crowd”. Bravo Shari! You continue to educate and inspire! Beautiful sketch and I love reading about the location. Thanks for sharing and contnue enjoying your travels. Looking forward to your next post. A harrowing tale & beautiful sketch! exotic land. Many mercii -s Shari B. Enjoying checking out your colours and techniques. Missed following your blog for the last while. I see such freshness and fluidity in your work. Inspirational for me!